This is my book from Guinea-Bissau for the Read The World challenge. Although ‘book’ is almost overselling it; it’s a pamphlet really. A total of twelve poems by nine poets, and even with an introduction, acknowledgements and the poems in both English and Portuguese, it’s only 44 pages. But the choices were limited; the only real alternative was a book of the collected speeches and writings of Amílcar Cabral, the politician and guerrilla leader who campaigned for independence for Guinea-Bissau and Cape Verde. Which probably would have been interesting, but I took the cheaper, lazier option and bought this instead. There are some strong thematic threads running through the poems: the forest, freedom fighters, saudade, eroticised women, slavery, nationalism. If I had been told they were all written by the same poet over a long period, that wouldn’t surprise me; although there may be stylistic differences that are flattened out in translation. Presumably that thematic similarity is at least partially an artefact of the selection process. But apparently the country’s intellectual tradition grew out of politics: the book is dedicated to Vasco Cabral* ‘who has been called the first Guinean intellectual’ and who, as well as being a poet, was freedom fighter, political prisoner and then government minister of the independent Guinea-Bissau. And in the forty years since independence (almost exactly: the anniversary is the Tuesday after next) there has been a civil war, so the theme of political violence hasn’t lost its relevance. As always with parallel texts, it was interesting to see some of the translation decisions, even without knowing any Portuguese. For example, one poem was broken up at different points in the English from the original — i.e. the white space appeared a couple of lines later in the translation — which seems weirdly arbitrary, but it would be fascinating to hear the reasoning behind it. Anyway, it was worth reading, I think; some of the poems worked better than others, in translation at least, with Hélder Proença the pick of the bunch. *no relation to Amílcar, as far as I can tell. 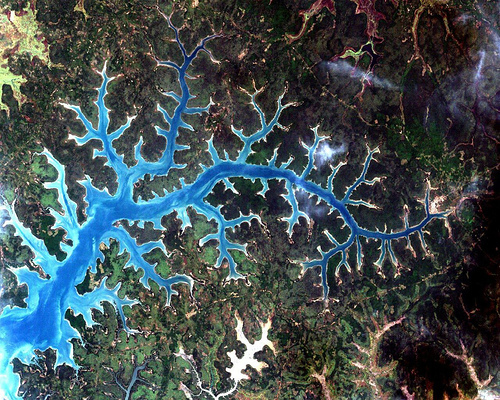 » The top image is of the Buba river in Guinea-Bissau. It’s from the US Geological Survey and therefore public domain. 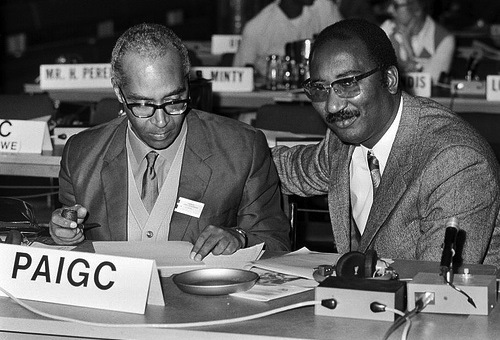 The second is of Vasco Cabral at the UN-OAU Oslo conference on Southern Africa (i.e. on apartheid), in his role as Administrative Secretary of the African Party for the Liberation of Guinea and Cape Verde (PAIGC), six months before independence in 1973. It is © the UN and used under a by-nc-nd licence.